ADDITIONAL IMPRINT COLORS: add $0.25 per extra imprint color, per barrel bag. PRODUCTION TIME: 7 days after art approval; rush production is available: contact us. Bulk cotton canvas drawstring barrel bags, personalized over a wide area or blank. 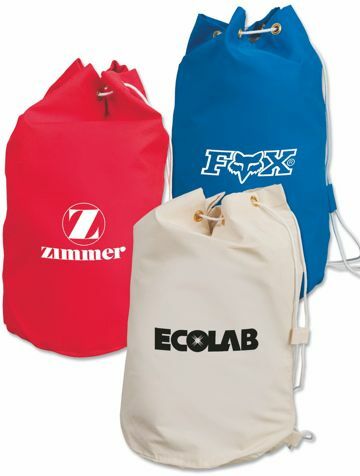 These sturdy promotional barrel bags are ideal for Beach, Boating, Laundry, Household, Trade Show or Travel. Budget Prices for USA, Canada for bulk personalized drawstring barrel bags. Free artwork design. American clients pay no taxes. We will send you a proof for your approval before production. 100% Cotton Canvas Drawstring Barrel Bag, 6 oz. IMPRINT AREA: 11-3/4" W x 12" H very large! COLORS AVAILABLE: Blue/White String, Natural Beige/White String, Red/White String. PACKAGING: 100 per carton @ 25 lbs.